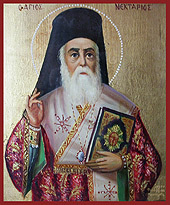 Saint Nektarios of Aegina, is the most widely known of Greek Orthodox Saints of the last two centuries. He was born in October 1st, 1846 in Selybria in Eastern Thrace (now in Turkey). He was one of seven children of Dimosthenis and Mpalou Kefalas and at Holy Baptism was given the name Anastasios. His parents were pious Christians and they brought him up according to the teaching of the Church. Having completed elementary school in his home-town, at the age of 14 he left his family to seek work and education in Constantinople (Istanbul). There he worked as a shop assistant in a tobacconist's shop and was able to earn a meagre living. He read as much as he could the Holy Scriptures and Writings of the Holy Fathers, and made a collection of wise sayings, which he used to write on the paper used to wrap his customers' goods. Later he worked as a teacher of the lower grades in the orphanage of the All-Holy Sepulchre. In 1866, at the age of 20, he went to the island of Chios, where he was appointed a teacher at a village named Lithi. After seven years he entered the famous monastery of Nea Moni, and at the age of 30, having completed three years as novice under the care of the venerable Elder Pachomios, he was tonsured as a monk and given the name Lazaros. A year later, in 1877, he was ordained a deacon and received the name Nektarios. Elder Pachomios convinced him he should complete his high school studies in Athens, which was made possible through the financial support of a wealthy local benefactor, Mr Horemis. After graduation he went to Alexandria to serve Patriarch Sophronios. The Patriarch insisted that Nektarios should complete his theological studies and sent him back to Athens. He graduated from the School of Theology in 1885. Upon return to Alexandria he was ordained priest in Cairo in 1886. His great service to the Church, his prolific writings and teachings, his energy and zeal, led to Father Nektarios' being ordained as Metropolitan of Pentapolis in Egypt, at a relatively young age. As a Metropolitan he was greatly admired and loved by his flock for his virtue and purity of life. But this great admiration by the people aroused the envy of certain priests, who did not want to see him elevated as Patriarch. They made accusations about him to the old Patriarch and succeeded in having the blessed Nektarios removed from office in 1890, in a manner clearly improper in the Church of Christ. He returned to Greece without trial or any explanation. He arrived in a very bad financial situation, and was refused any position because he was not a Greek citizen. Finally he was assigned to Evia. In 1894 the blessed Nektarios became Director of the Rizarios Ecclesiastical School in Athens, where he was to remain for 15 years. His own example, as priest and man, was the most important lesson for his students. These years were also productive for the writing of many of his books. By 1900 his health became weak from all his pastoral and scholarly work. In 1904 he founded a monastery for women in Aegina, the Holy Trinity Convent, which flourished under his guidance. In March 1908 he resigned his position at the Rizarios and withdrew to the monastery. He lived the rest of his life as a true monk and ascetic. His holy and pious life shone forth like a guiding light to all near him. Through his prayers many people were healed. In September 1920 he went into a hospital in Athens. He was placed in a ward reserved for the poor and unwanted. At 10.30 in the evening of November 8th, in terrible pain but in peace and at prayer, he gave up his spirit to God, at the age of 74. After his repose his Holy Body emitted a beautiful fragrance and many came to venerate his Holy relics. He was buried in his monastery in the place he had chosen, under a tree. For various reasons his tomb was opened a number of times after his burial. For 20 years his body was found intact and emitted a wonderful and heavenly fragrance. Many people had regarded him as a Saint in his lifetime, because of his purity of life, his virtues, the theological nature of his publications, true to the tradition of the Church, his gift of foreknowledge and the miracles he performed. This recognition of him as a Saint spread rapidly after his repose. The Ecumenical Patriarchate of Constantinople proclaimed him a Saint on April 20, 1961. His memory is celebrated on November 9th. Our monastery celebrates Saint Nektarios' feast day on the 9th of November. Glory to Christ who gave you glory! Glory to Him who made you wondrous! We have been blessed enough to have at our monastery a small fragment of the relic of Saint Nektarios who was given to us by the late Metropolitan of Sudan, Titos. We also have an icon of Saint Nektarios that was painted by the nephew and God child of Saint Nektarios, Anastasios Kefalas that was given as a blessing to our monastery. On the feast day of Saint Nektarios we offer these relics for veneration to the faithful who visit our monastery.